Documentation of Selected Works 1971-74. Video. 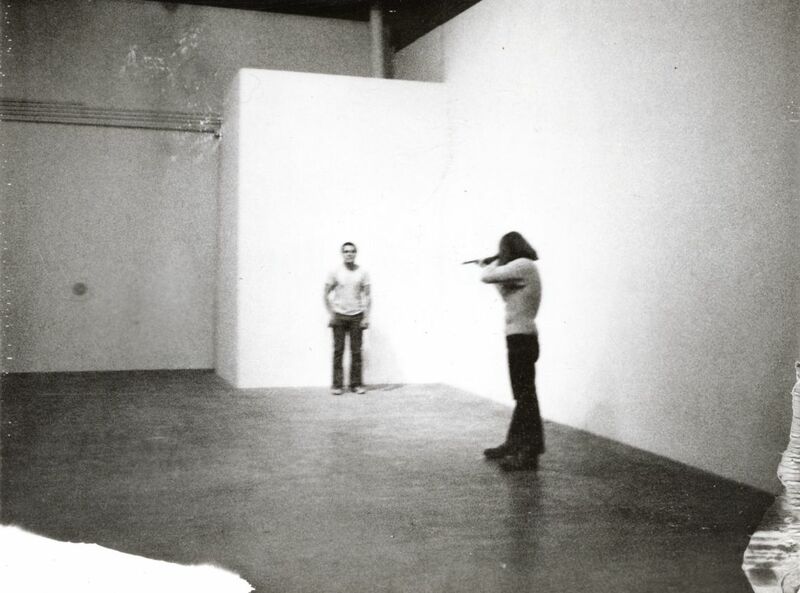 Chris Burden, Shoot (1971). F Space, Santa Ana, CA. November 19, 1971. At 7:45 p.m. I was shot in the left arm by a friend. The bullet was a copper jacket .22 long rifle. My friend was standing about fifteen feet from me. © Chris Burden. Courtesy of the artist and Gagosian Gallery. Chris Burden (1946 - 2015) was an American artist working in performance, sculpture, and installation art. During the early seventies, many of the early mature pieces of Burden requested art to be ephemeral and to address political, social, environmental and technological change, challenging viewers’ beliefs and attitudes about art and the contemporary world. Simple performances were most controversial as the idea of personal danger as artistic expression was central. His consequent live oeuvre shows the artist having himself shot (Shoot, 1971); locked up (Five Day Locker Piece, 1971); electrocuted (Doorway to Heaven, 1973), cut (Through the Night Softly, 1973); crucified (Trans-fixed, 1974), and advertised on television (4 TV Ads, 1973–77). The VENICE INTERNATIONAL PERFORMANCE ART WEEK 2014 presents Burden’s video Documentation of Selected Works 1971-74. Guided by the artist's candid, explanatory comments on both the works and the documental process, these segments reveal the major themes of Burden's work - the psychological experience of danger, pain, and physical risk, the aggressive abuse of the body as an art object, and the psychology of the artist/spectator relationship. This compilation is an historical document of one of the most extreme manifestations of 1970s conceptual performance art. Courtesy of the artist, Electronic Arts Intermix, New York, and Gagosian Gallery, Los Angeles - New York.